Brian Elliott made 28 saves in Sunday's win over Dallas. DALLAS Kevin Shattenkirk and the St. Louis Blues took advantage of Dallas’ struggling penalty killers – with only a few seconds to spare. Shattenkirk scored a power-play goal 4:49 into overtime, giving the Blues a 3-2 victory over the Stars on Sunday. Jaden Schwartz had a goal in his fifth straight game and T.J. Oshie also scored for the Blues, who improved to 12-0-1 against Central Division opponents. Brian Elliott made 28 saves to win for the second consecutive night. After the Stars failed to score with a man advantage earlier in overtime, Kevin Connauton was penalized for tripping at 4:24. Shattenkirk took a pass from Alex Pietrangelo in the left circle and shot the puck past goalie Kari Lehtonen into the lower right side of the net. Vladimir Sobotka also assisted. "(Sobotka) did a lot of work on that," Blues coach Ken Hitchcock said. "He did a lot of work creating the penalty and did a great job obviously on the goal." Dallas overcame a 2-0 deficit with second-period goals by Jamie Benn and Ryan Garbutt. Schwartz opened the scoring on a power play at 2:41 of the first. He has one goal in each of his last five games. St. Louis scored off a Stars mistake at 5:12 of the second. Oshie picked up the puck after Connauton whiffed on a pass in his own end. Dallas scored only its third power-play goal at home this season when Benn got his fourth goal in five games at 8:13. Garbutt tied it 2-all at 11:31 on a screened shot from the left point that went between Elliott’s legs. Lehtonen stopped 19 shots for Dallas, which came into the game with an 89 percent success rate on the penalty kill. "We had our opportunity in overtime and we didn’t get it done," Stars coach Lindy Ruff said. "We can look at the two one-timers that we shot. We missed the net on both, and their one-timer found a hole." The Blues have earned at least a point in six consecutive road games (4-0-2), extending their season-best streak. Sobotka returned after missing six games because of an upper-body injury and had two assists. He stepped in for captain David Backes, out because of an upper-body injury sustained Saturday against Chicago. "(Sobotka) is a player that you can rely on in every situation. He’s just a great player all around," Schwartz said. "It was a big jump for us and a big positive leap getting him back in the lineup." It appeared that Dallas had scored in the first minute for the second consecutive game when Cody Eakin batted in a rebound of Garbutt’s shot. But the goal was disallowed because Garbutt didn’t allow Elliott to make a play on the puck. "I thought we did our best to try to avoid contact. It’s a tough call," Ruff said. "They make a decision on the ice, and it’s made." After a disputed icing call, Garbutt received a penalty for unsportsmanlike conduct. While he was in the box, Schwartz took a cross-ice pass from Sobotka and put the puck into the open right side of the net. "It was frustrating to get that goal waved off, especially after the one they had in St. Louis on us," Garbutt said. "But I can’t really do anything about that. That was definitely something I had to fight back from and help the team." Schwartz has 13 goals this season. His five-game streak has him halfway to the Blues record of 10 set by Brett Hull — twice. 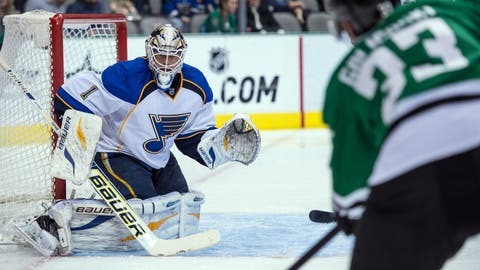 Lehtonen stopped St. Louis’ second-best scoring chance in the period with a pad save of Vladimir Tarasenko’s wrist shot. Neither team had a goal or a penalty in a defense-minded third period, when Dallas outshot the Blues 8-4. "We were outplayed in the second, but in the third we really managed the game properly and did a good job," Hitchcock said. Oshie received a slashing penalty at 1:11 of overtime, but the Stars couldn’t take advantage. "You look at the attempts at the net and the amount of chances we had vs. they, and they’re a better team at finishing off some opportunities," Ruff said. NOTES: Dallas is 3 for 63 (5 percent) with a man advantage at home this season. … With Backes sidelined and Alexander Steen on injured reserve, St. Louis was without its top two goal scorers. … Dallas’ Alex Chiasson returned after missing two games because of the flu. … Also returning was Blues forward Brenden Morrow, the Stars’ captain for six-plus seasons, for his first game in Dallas since being traded last March. The Stars played a video tribute to Morrow during a first-period timeout. "It was a nice little tribute. I just wanted to make sure I got through it, didn’t tear up and acknowledged everyone," Morrow said.